We are a leading Fort Lauderdale Web Design and development agency. UltraWeb Marketing creates results driven web designs for businesses of all sizes. We offer a variety of online marketing services from web design, social, SEO and PPC (pay per click) with our speciality being eCommerce web design. All of our Fort Lauderdale Web Design packages include a base SEO foundation for your new website. Having a core in place that sets the table for future success with your search engine optimization goals is fundamental to better search engine visibility. We understand the main goal is to drive pre-qualified traffic that will convert into better leads and sales. 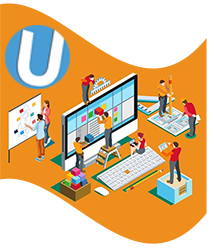 UltraWeb Marketing uses a proven PROCESS that is successful time and time again for many of our Fort Lauderdale Web Design customers. In order for us to develop a web design that is exactly what you are looking for, we keep you and your team involved every step of the way. Another one of our areas of expertise is software design. We created a custom client portal application that allows all team members to be involved at any desired level. All communication, uploaded and correspondence are together in one easy to access area online. We have found this is the best solution for communication between clients and our team members. In the past we might have one team member get over 100 emails in a few weeks and going back and digging through the previous correspondence became to much to keep track of properly. This process of communicating has proven to eliminate miscommunications and allows for our whole team to be notified immediately anytime a request has been made. Our discovery stage is the period where we lay out the complete Fort Lauderdale Web Design project from beginning to end. You are always welcome to come to our office and sit down with our web design team to make sure your vision is interpreted and we all get on the same page. Once the site hierarchy and link structure is determined will proceed with the user experience. Having easily identifiable CTA (call to action) on every page is crucial. You should never make a person guess how to fill out a form or click a button to make a phone call. Forms and click to call buttons should be discreetly placed all throughout the website so the flow of the site is not interrupted. The initial concept and color schemes are generally related to your company logo. From there we can layout a mockup header and footer with some place holders for headers and tex. We will also create an animated carousel banner image for the home page that gives and idea of what the Fort Lauderdale Web Design will look like across the board. The site look and feel should be the same with only text content and images changing from page to page. Samples of websites that you like are extremely helpful for seeing your vision more clearly. Once the design and UX are approved we will then move onto the development of the front end. UltraWeb Marketing strictly adheres to all W3C requirements and standards. Custom HTML, CSS and jQuery are used to build the front end of your Fort Lauderdale Web Design via the ever popular WordPress platform. We make sure your website is always scalable and compatible for any web based browser. WordPress is great about creating a robust back end. With that being said sometimes customizations, paid plugins and add ons are needed to deliver the functionality you require depending on the complexities of your website requirements. All of the custom programming and design work that is performed when creating your website is done in a modular manner. This means if you want to make changes down the road we don’t have to tear the whole site down. Scalability is another great benefit of a WordPress Web Design. Once we have integrated all of the pages into the WordPress CMS (content management system) we will take the content provided by you to build out the individual website pages. These include logos, icons, photographs, tables and any other pertinent data to your company. All of this content can be delivered easily in our project portal via upload or drag and drop. In addition to testing on all the major browsers for appearance and functionality we do in depth mobile and smart device testing. Before the site goes live it will be presented to your team on our development server so additional Q&A testing can be performed from your end. This is always the most rewarding part for all parties involved. We take great pride in our design work and love to do nothing more than meet and exceed all of our clients expectations for a Fort Lauderdale Web Design.